Five black concert promoters have filed a $700 million lawsuit against 11 talent agencies and 29 concert promoters, charging that a longstanding conspiracy bars blacks from promoting white performers and top black acts. "These guys just got tired of riding at the back of the bus," explained Robert Donnelly, a music-industry attorney representing the plaintiffs. "We want to enjoin the conspirators from being able to block black promoters from bidding on concerts." The suit, filed late Thursday in U.S. District Court in New York City, makes civil rights and anti-trust claims against 11 major talent agencies and 29 promoters, including the talent-agent giants William Morris Agency and Creative Artists Agency; corporate concert-booker and venue-operator SFX Entertainment, Inc., and many of the latter's recently purchased subsidiaries, including Bill Graham Enterprises, Inc., Sunshine Promotions Inc., and Delsener/Slater Enterprises, Ltd. 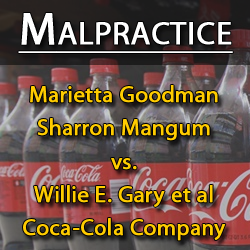 The plaintiffs — Rowe Entertainment, Inc., of Atlanta; BAB Productions, Inc., of Charlotte, N.C.; Sun Song Productions Inc., of New York; Summitt Management Corporation of Memphis, Tenn.; and Lee King Productions of Jackson, Miss. -- allege they "are never contacted by the booking agent defendants to promote concerts to be given by white artists, and are often excluded from the promotion of concerts to be given by major black artists, even though the plaintiffs are fully able to promote all such concerts and to compete with white concert promoters for all concert promotion business." Representatives for William Morris Agency, Creative Artists Agency and SFX Entertainment had no comment on the suit. 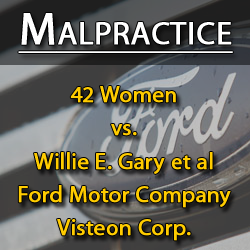 The plaintiffs referred calls for comment back to their lawyers. At the heart of the suit lies the accusation that the promoters have been selected to promote up-and-coming acts but are shut out of the bidding process once those acts break into a bigger audience. LOS ANGELES — About 50 people gathered outside the office of the high-powered William Morris talent agency Thursday morning (Feb. 11) to protest alleged racism in the concert industry on behalf of five African-American promoters. When the protesters, holding signs reading "This agency does not represent civil rights" and "Stop discrimination," were accused of trespassing by a security guard there, they moved on to the nearby Creative Artists Agency, another major entertainment firm, where they received similar treatment from security. Judge Robert P. Patterson's actions were both a shame and a profound disgrace. His name should forever live in infamy much like Chief Justice Roger B. Taney whose deplorable decision in the Dred Scott v. Sanford case (which held that black people have no rights which white people are bound to respect) continues to live in the actions of judges like Robert P. Patterson. He should be brought before the Congress and impeached for his misconduct. Until America plays by "one set of rules" there will forever be disparities in the justice system. And until there is real fairness, impartiality and an equal application of the law, America will remain a two tier society. 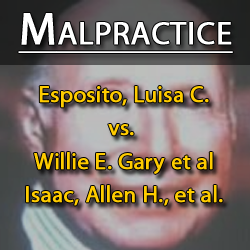 It is obviously evident that corruption reared its ugly head in this case and it should outrage all black people in particular as well as all fair minded and well intentioned people of whatever race, creed or color in general when justice is thwarted and the rights of litigants are subverted by a judge that didn't care about the proper exercise of his duties, obligations and the oath of office that he swore to uphold the Constitution and laws of the United States. The arc of the moral universe is long, but it bends towards justice. — Martin Luther King, Jr.
On June 24, I had the opportunity to co-host with Roseanne Barr on her show, heard each Sunday on KCAA radio. Our guest was legendary concert promoter and long-time friend and manager of Michael Jackson, Leonard Rowe. Our subject: racism in Hollywood. Both Roseanne and I were shocked, but not surprised by the things we were hearing from Mr. Rowe. And we were shocked, but not surprised by the document(s) Mr. Rowe had in his possession and that were filed with the Court, yet completely ignored by the Court, to date. Mr. Rowe talked about the inequities he witnessed in the industry against black concert promoters during his 30-plus years in the entertainment business. Inequities such as: no black concert promoter, in the 114 year history of The William Morris agency, had ever been allowed to engage in a contract with a white entertainer or artist for a concert performance. Yet, in reverse, white concert promoters are able to engage in contracts with artists, of any race — black or white. Another example: black promoters are required to pay a 50 percent deposit for the artist that they will promote for a concert. Yet, conversely, white promoters pay 0 to 10 percent as a deposit to promote any and all artist of their choice. 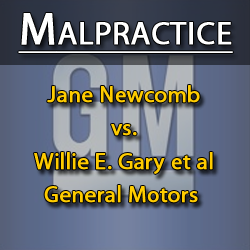 Absent Mr. Gary's betrayal and duplicitous conduct, Mr. Rowe feels that his case would not have been dismissed by defendant's summary judgment motion. 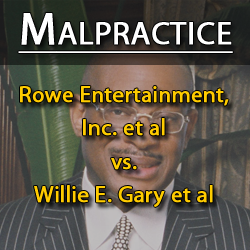 Mr. Gary did what very few attorneys would ever think about doing to their own race — he betrayed not only his own client, but his own race of people, in order to enrich himself, states Rowe. 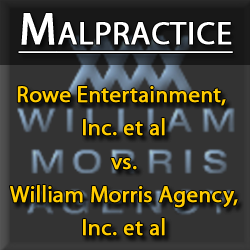 Here is a bit of the data underlying Rowe's lawsuit: In the 114 year history of The William Morris Agency, no black concert promoter has ever been allowed to engage in a contract with a white entertainer or artist for a live concert performance. Yet, white concert promoters are able to engage in contracts with artists, of all races, be they black or white. The law plainly states that no person, can be denied the right to engage in a contract, based on their race.